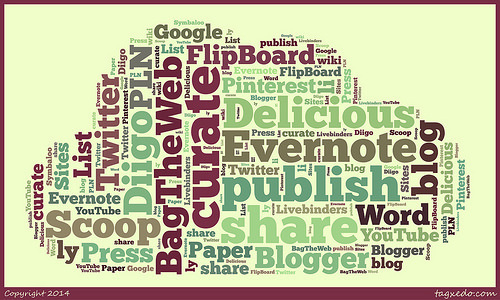 In many of my classes I have students reading, writing, making, and sharing in online spaces. This may include blogging, tweeting, or connecting with others on Twitter or Google+. In some of my more advanced classes, I ask students to go use the Internet to learn something…anything. At the end of the individual learning modules, I ask that they indicate or document what they have learned. 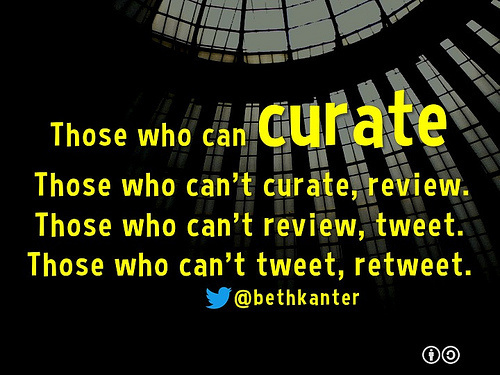 In this process we are practicing content curation as a form of assessment. In my work I try and move learners from content consumers, to content curators, to content constructors in online spaces. I believe content curation is a valuable step in the process. You are actively reviewing and evaluating content from an informed perspective and sharing this out with others. You might be an expert in reading comprehension strategies, fine leather handbags, or exercise routines. Regardless of the field, or the tools used (e.g., Diigo, Pinterest, Learnist), I believe you are performing a valuable service online as you curate the web. One of the top tools I use, and use in my classes is Storify. Storify is a free online tool that scrapes social networks to find, collect, and share what people are saying all over the web. Please review the following video overview and tutorial on Storify. For a more detailed overview of the tool, please visit the Storify page on the Digital Texts and Tools repository. As detailed earlier, I use Storify in some of graduate level classes. I want my students to search and sift online texts, connect with other learners, and document their learning. I trust that they will be able to negotiate these online spaces without getting lost in some bad places. I also want them to learn in a networked space while respecting the challenges and opportunities of the open web. Students create Storify stories to document their learning over a module or block of content. They are to reflect during the process and guide the reader as they help identify what they have learned. I have also worked with secondary teachers as they use Storify to create their own stories to share with students. These stories are used as introductory activities to build prior knowledge, or closing activities to review in a unit. I recommend that teachers create and use Storify in secondary settings. If you want to have students use the tool to create a story, my recommendation is to have students curate and share content with the teacher using email or some other vehicle. Then the teacher can add this content to the class story. Finally, I recommend embedding the Storify stories in your website or classroom blog. Students can click through the links in Storify to get out to the various social networks. However, in my humble opinion, it is far better to have students review and use content that you have edited to your digital learning hub…as opposed to traipsing across the Internet looking for breadcrumbs that you have left behind.